Do you wish you had a moment to yourself? For holiday shopping or cleaning…or just a good, long nap? On December 3, take advantage of our Holiday Drop and Shop fundraiser. Just bring your kids to Wee Creekers and we’ll entertain them for a few hours…or even the whole day! All proceeds benefit CCC Park and Recreation. All ages accepted, but space is limited. Please provide a lunch or snack for your child. 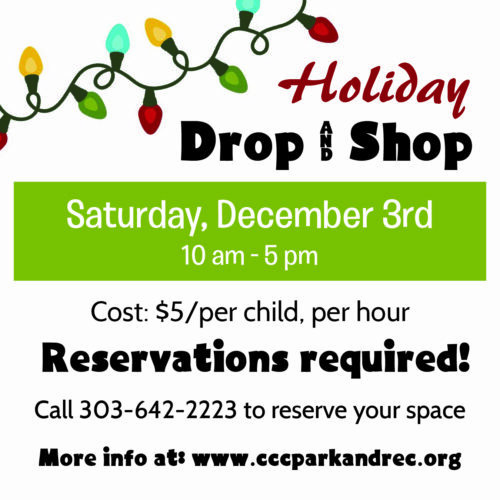 Call 303-642-2223 or email info@cccparkandrec.org to make a reservation!